We at Android Police take our mobile security pretty seriously. It's in the job description. Entering the realm of mobile security today is yet another contender on the good side of the battle: VirusTotal has released its client for Android. Prior to this, VirusTotal was a simple website where you can upload suspicious files to be scanned by a multitude of antivirus engines. 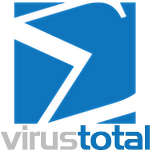 Having provided this desktop OS-oriented service for several years now, VirusTotal has brought its experience and expertise to mobile. 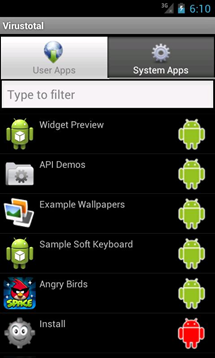 However, its mobile offering is slightly different than its desktop counterpart. 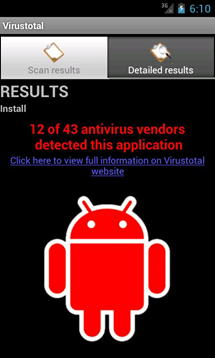 As mobile devices are often data-limited, VirusTotal for Android instead checks an identifying hash of each application installed on your mobile device against the website's database. If your applications have already been uploaded to VirusTotal by someone else, you will get results based on that. If an app crops up that has not been scanned before, you then have the option to upload it for an on-demand scan. Looking at the screenshots, it's clear that the emphasis is on functionality rather than contemporary UI design, but given the utility nature of the application things like a slick interface are a distant second to the benevolent service offered.